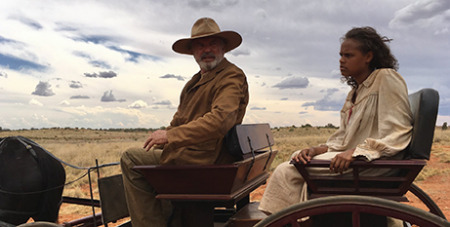 The jury of the Australian Catholic Office for Film and Broadcasting has named Warwick Thornton’s period western, Sweet Country, the Australian Film of the Year. Set in 1929 in the Northern Territory’s outback, the film tells the story of an Indigenous farmhand, Sam Kelly (Hamilton Morris), who kills a white man in self-defence, and goes on the run from a small posse, led by Sergeant Fletcher (Bryan Brown). While on the run, Sam is befriended by a concerned Christian preacher (Sam Neill). The film is based on actual events, and director Thornton is Indigenous. It targets black humiliation and white racism, and depicts terrible injustice in a country hostile to Indigenous peoples. Thornton directs a movie with historical and emotive significance – the film suggesting strongly that racism is still prevalent in a “sweet country” called Australia. It has striking images of the outback, and its cinematography is exceptional. Under Thornton’s assured direction, scenes of the outback capture the isolation and harshness of the land brilliantly. The jury was chaired by Fr Richard Leonard SJ included Fr Peter Malone MSC, Professor Peter Sheehan and Callum Ryan. The judging panel also commended Benjamin Gilmour’s Jirga. Sweet Country also won six awards last night's 60th AACTA and AFI Awards in Sydney, including best film, the Sydney Morning Herald reports. Among the film's haul was the Best Direction award for Thornton, while Morris took out the Best Lead Actor award.